Twelve-year-old Caroline is a Hurricane Child, born on Water Island during a storm. Coming into this world during a hurricane is unlucky, and Caroline has had her share of bad luck already. She's hated by everyone in her small school, she can see things t Prepare to be swept up by this exquisite novel that reminds us that grief and love can open the world in mystical ways. To ask other readers questions about Hurricane Child, please sign up. What an amazing, complex, moving portrayal of a young queer black girl from Water Island in the Caribbean. Caroline's story is about grief, love, family, queer crushes, bullying, shadism, (internalized) homophobia, and friendship. It has a lovely poetic, magical realism to it. It felt very authentic to a twelve year old's world while is dealt with 'adult' issues but never simplified or talked down. This book was a wonderful reminder of how deeply children feel. There is a phrase in Kheryn Callender’s Hurricane Child that comes to mind when I think of this book, “exquisitely beautiful,” and truly, there are only a handful of alternative word combinations that can just as aptly describe this debut. Callender’s handling of bullying, first loves, queer love and family is the kind of literature we want, no, *need* our kids to grow up on. The author expertly captures what it means to be a child of the Caribbean, highlighting experiences so universal among us There is a phrase in Kheryn Callender’s Hurricane Child that comes to mind when I think of this book, “exquisitely beautiful,” and truly, there are only a handful of alternative word combinations that can just as aptly describe this debut. Callender’s handling of bullying, first loves, queer love and family is the kind of literature we want, no, *need* our kids to grow up on. The author expertly captures what it means to be a child of the Caribbean, highlighting experiences so universal among us that it left me smiling, giggling and flat out laughing. 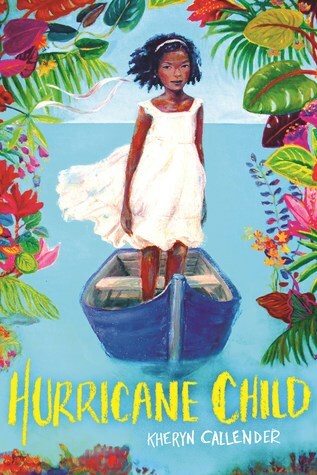 It’s interesting that the protagonist, Caroline, mentions Jamaica Kincaid and Tiphanie Yanique as some of her favourite authors, as we would immediately compare Hurricane Child to Kincaid’s Annie John. Callender’s writing is vivid and absorptive, so much so that one can describe it as palatable, and nothing short of a sensory overload. Their language and word choice gave me goose-bumps. This may be a book written with a middle-grade audience, but one clear standout is that not once does Callender condescend to their audience, choosing instead to address them writing to them as equals. Caroline is a protagonist that readers will find extremely relatable, a child who is curious, awkward, vulnerable and mischievous. Not only is this a Black protagonist from the Caribbean (I’m forever hyped about this), but a Black, Queer protagonist from the Caribbean. Hurricane Child addresses all these intersectionalities, tackling internalized homophobia, religion, microaggressions, colourism and misogynoir. This is a book that deserves to be added to high school curricula as it will spark the kind of discussion that readers (particularly Caribbean readers) need to have. By sharing Hurricane Child with readers, Callender gives us a story that is full of hope and resolution; themes which we desperately need in middle-grade literature. We are excited about Callender’s debut, and can’t wait to see what they bring us next. Thank you to Scholastic for sending us a copy in exchange for an honest review. Vivid and poetic. I'd add it to my books that should be movies shelf, but a movie would not be able to do the prose justice. Reminded me a bit of When Marnie Was There. There is so much packed into this 200 page book, and yet no question goes unanswered by the time you've made the journey. Okay. I barely have words for how good this book is. Do yourself a favor and pre-order it now. #RWLChallenge: A book written by a trans or non-binary author of colour. Full review forthcoming via Rebel Women Lit. This book is SO GOOD. Wow. Wow! I loved everything about it. I want every kid to have access to it. This is a middle grade book with excellent writing that deals with real issues in a complex way. It feels like the author really understands young people and trusts them to manage very complicated experiences with careful consideration and bravery. I loved the main character and the way she perceived and experienced the world. I loved the way queerness was talked about and felt. I loved the story This book is SO GOOD. Wow. Wow! I loved everything about it. I want every kid to have access to it. This is a middle grade book with excellent writing that deals with real issues in a complex way. It feels like the author really understands young people and trusts them to manage very complicated experiences with careful consideration and bravery. I loved the main character and the way she perceived and experienced the world. I loved the way queerness was talked about and felt. I loved the story so so much. I can’t wait to see what this author does next. They have a YA novel coming in the fall. I feel prepared to be obsessed with them. Exactly what I needed... decades ago. This gorgeous and heartfelt novel is not one to miss. I don't think I've ever read a setting so tangibly depicted. Everything about Caroline's reality comes soaring to life as you enter her world, and you won't want to leave until you find out what has happened to her mother. This one has earned a permanent spot on my shelf. This was a really beautiful book. It would've been great to read this when I was twelve, I think. I liked how it handled the journeys of all three characters: our lead (being a baby lesbian, feeling abandoned, being bullied); her best friend (internalized homophobia, dealing with peer pressure); and her mother (dealing with depression, and finding self fulfillment) and how each worked through their own emotions to get to a better place. It’s a very beautiful little little book. Caroline's mother has left and she has no idea why. Ever since she was little, Caroline has seen things that others can't see, but she has no idea what it means. When a new girl shows up at her school, inspiring new and intriguing feelings in Caroline, she agrees to help Caroline find her mother. As a child born during a hurricane, Caroline hopes she'll be able to weather any storm, but this one will test her to the limits. This book had its moments, but it was a little unfocused at times. Betwe Caroline's mother has left and she has no idea why. Ever since she was little, Caroline has seen things that others can't see, but she has no idea what it means. When a new girl shows up at her school, inspiring new and intriguing feelings in Caroline, she agrees to help Caroline find her mother. As a child born during a hurricane, Caroline hopes she'll be able to weather any storm, but this one will test her to the limits. Hurricane Child is about a young girl in the Virgin Islands whose mother abandons her, who is bullied, and who develops a crush on a female classmate. The book address issues of racism, colorism, homophobia and also takes some insane detours into spiritualism and parallel worlds. So much is packed into a short book. The writing is lyrical and literary and I just loved it. Good quotes: "I think we must be closer to being alive than adults. They've been alive too long to remember the passion of liv Hurricane Child is about a young girl in the Virgin Islands whose mother abandons her, who is bullied, and who develops a crush on a female classmate. The book address issues of racism, colorism, homophobia and also takes some insane detours into spiritualism and parallel worlds. So much is packed into a short book. The writing is lyrical and literary and I just loved it. Good quotes: "I think we must be closer to being alive than adults. They've been alive too long to remember the passion of live. And maybe [...] the only animals on this Earth that really understand life are the insects that are born and mate and die within seconds. They're really the ones that understand it all." This is an absolutely beautiful, often heartbreaking, novel. The first-person descriptions of the twelve-year-old main character being bullied just about broke me. I love that coming out to herself was part of her story, but there were so many things going on in the MC's life, and they all felt 100% true to the story and the narrative voice. I don't know where to begin to describe a short middle-grade book that does so many things to perfection except to say Hurricane Child is an amazing debut, and I will read everything Kheryn Callender writes. Krystel Roche's narration of the audiobook is wonderful. It was like the world got confused and turned upside down, and we were floating on the stars, and above our heads were the jellyfish and the sea. This book is so dam beautiful and I felt so tingly and charged after reading it. Kheryn Callender is from St. Thomas and was able to craft such an exquisitely beautiful, haunting, and magical story about a queer black girl from an island in the Caribbean. The writing is so vivid and at times I felt a bit of sensory overload. So while I quite enjoyed l It was like the world got confused and turned upside down, and we were floating on the stars, and above our heads were the jellyfish and the sea. This book is so dam beautiful and I felt so tingly and charged after reading it. Kheryn Callender is from St. Thomas and was able to craft such an exquisitely beautiful, haunting, and magical story about a queer black girl from an island in the Caribbean. The writing is so vivid and at times I felt a bit of sensory overload. So while I quite enjoyed listening to the audiobook (which is also narrated by a Caribbean voice actress named Krystel Roche!) I felt myself needing the eBook to follow along to annotate. This is a middle grade that also confronts and challenges some very important topics such as colorism, homophobia as related to religion, internalized homophobia, misogynoir, and depression. I love that the author really seems to understand the experiences that young people encounter and trusts them to manage these complicated experiences. This is mostly a character driven story so if you need more plot in your stories this may not be for you. However, I loved Caroline's voice so much and was overall happy with the message of hope and self acceptance. Go read this! This reads like it should be a classic. This book was not for me. Not only were the main characters unlikable, but the themes in this story seemed much too heavy to be geared toward young readers (now, I know, depending on where children grow up and what their sexual orientation is, or what their home life is like, this story isn't any worse than what they've experienced, but the way this story is written doesn't seem like it would bring a reader in, especially a young reader. The writing style, to me, doesn't seem as if it were writt This book was not for me. Not only were the main characters unlikable, but the themes in this story seemed much too heavy to be geared toward young readers (now, I know, depending on where children grow up and what their sexual orientation is, or what their home life is like, this story isn't any worse than what they've experienced, but the way this story is written doesn't seem like it would bring a reader in, especially a young reader. The writing style, to me, doesn't seem as if it were written for the age the main character is, but this is my opinion). I will just say that I don't know what kind of reader I would ever be able to recommend this book to, because the story is challenging, the narrative is a bit all over the place, and there is not much of a plot. Caroline Murphy is a difficult narrator to follow. She is bullied in school, but she is also very moody and, despite her father being a generally positive presence in her life, she cannot seem to care or love him. She often says things like: "I am all alone in this world," or "I have no one," when she has her dad and I see no real reason for her to dislike him. When a new girl comes to school from Barbados, she and Caroline become friends rather inexplicably. First, the girl only hangs out with the popular kids, while Caroline is shunned. Then, for some reason, she agrees to hang out with Caroline after school. After that, they are two peas in a pod. It's sudden, but then most of the events in this book happen suddenly and without much leading up to it. When Caroline and her new friend, Kalinda, go walking in town, they see two women holding hands. In St. Thomas, adults holding hands is a sign of homosexuality, and is viewed as disgusting, which Kalinda even says when they see them. It is in this moment that Caroline suddenly discovers that she is gay and that she in fact LOVES Kalinda and wants to marry her. They are twelve. This, to me, is a very strange and out of the blue development to the story, which, up until this point doesn't seem to have any plot. Most of the book up until this point has been a chronicaling of Caroline's very sad life being bullied in school and wanting to find her mom, who left years ago. I think what bothered me most about this story was its lack of direction and its unlikable characters. The only major action that happens is in the last 1/4th of the story. The fact that Caroline confesses her love to Kalinda and that Kalinda suddenly reveals that (view spoiler)[she loves Caroline in the same way (hide spoiler)] is almost too much of a coincidence and these twelve year olds seem to think they have their life all figured out, down to imagining their married lives, and that seeing someone die is what makes you an adult, is both bizarre and an inexplicable plot point. Another plot point that is never really answered is whether the spirit Caroline sees is real or not. I don't know whether the book contains a supernatural element or not. I cant even tell if Kalinda really can see the same spirit as Caroline or she's just pretending.It bothered me the whole time. Once the story began to wrap up, all I felt was confused and that I wanted my time back. I read this book for a book club, or else I would a) most likely not have picked it up or b) would have put it down unfinished. I also listened to the audio book which, even if I were to recommend this story, I would not recommend listening to the audio. It is read by a woman with a heavy accent, who reads sentences almost like she doesn't know where the sentence will end up, and whose only way of differentiating between voices is to read Caroline's voice really loudly and everyone else very softly. This loud/soft thing coupled with her accent makes it really hard to understand what she is saying a good portion of the time. I would not recommend it to kids. I think they would get very frustrated. I understand the decision to have a reader who speaks with the accent that the characters would have, but it's too thick or else they just didn't consider their audience. This review has been hidden because it contains spoilers. To view it, click here. I feel strongly that we need more books like this in the world -- queer/questioning child, set in the Carribean, own voices, deals with mental illness. Beautifully written, in a dreamy, intense, adult novel kind of way. I assume that this is my failing, because I don't really enjoy dreamy, drifty sorts of books when they are filled with cruelty, even while I can appreciate the reality they depict. But I think the real thing is that this child is abandoned by her parent and no one eve I feel strongly that we need more books like this in the world -- queer/questioning child, set in the Carribean, own voices, deals with mental illness. Beautifully written, in a dreamy, intense, adult novel kind of way. And when she expresses how angry she is about this situation, her teacher tells her that she's being self-absorbed. I find this completely outrageous and more than a little horrifying. I also suspect that my feelings of outrage come from a place of privilege, where I've never needed to face this kind of pragmatic abandonment. There aren't enough books about little girls who struggle to feel love while trying to reconcile their romantic feelings for other girls. Caroline Murphy grows up on Water Island and rides a boat to school on St Thomas. This depiction of the U.S. Virgin Islands is much more real than images created to promote tourism and you can tell there are whole worlds hidden from outsiders. What a great book and refreshing. I will be writing a review for an online journal so I have kept my Goodreads review brief here. • The first middle grade novel I’ve read with an f/f romance! •	The first middle grade novel I’ve read with an f/f romance! •	Caroline and Kalinda feel authentically twelve years old. This is something that’s difficult to nail in middle grade, but it’s perfect here. I especially liked the scenes where Caroline and Kalinda question if their thoughts are too complex and melancholy for their age, which is something I remember thinking at that age and which my sister has asked me about before. •	This part which particularly struck me was when Caroline challenges Kalinda on something she says and this shocks both of them because “Kalinda has always been the one in charge of this relationship. The one who does not need me as much as I need her…she doesn’t take advantage of it”. From this moment on, their dynamic shifts to become more equal. Something I realised this year, as a result of making more friends than I’ve ever had before and forming said friendships quicker than I’ve ever done before (that’s uni life for you! ), is that as a result of various factors, I tend to view myself as the ‘inferior’ or ‘passive’ one in the majority of my relationships. I doubt that the other person views themselves as the ‘superior’ one, but that’s how I’ve been made to feel before and I carry that with me. Hence, I’ve been working to not view my relationships through this lens as well as speaking up and taking on more active roles. Representation: Protagonist Caroline is Black Water Islander and a WLW (sexuality unspecified). LI Kalinda is Afro-Barbadian and a WLW (also sexuality unspecified). (view spoiler)[Caroline’s mother is bisexual (word not used, her partner is a man and she was in a relationship with Caroline’s principal, an important side character) (hide spoiler)]. All major characters are Black Water Islander or Black Saint Thomian, set in Water Island and Saint Thomas. Ownvoices/author info: Kheryn Callender is a Black Saint Thomian American nonbinary trans MLM. It's about Caroline, a lonely black girl living on Water Island looking for her mother who has disappeared. She's twelve years old, sometimes sees things no one else can see and has never had a friend before Kalinda arrives at school. I still kind of feel like floating on this story. The writing..felt like the sea? idk, but it fits great with the magical realism. It's heartbreaking too. It's about first love, two girls, family and all the pain and joy those thin This was such an interesting story! I still kind of feel like floating on this story. The writing..felt like the sea? idk, but it fits great with the magical realism. It's heartbreaking too. It's about first love, two girls, family and all the pain and joy those things can give us. It feels bittersweet, because there was so much hurt, but also so much hope. Kalinda's internalised homophobia and that of the others, a lot of it was rooted in Christianity, which came pretty close to home, so just a warning to take care of yourself if this is triggering or hurtful for you. I absolutely love that I could read a middle-grade book about a black girl realising she loves another girl and the journey towards becoming herself, finding a place and a voice. I am grateful this book exists. "This is what hurts the most. Silencing myself when I've fought so hard to be heard." A lovely middle grade novel about the power of friendship and family. Caroline lives with her father on Water Island, a small island near St. Thomas in the US Virgin Islands. She's angry (her mom took off a year ago), lonely (she's bullied by the wealthier and lighter-skinned girls at school), and haunted by spirits no one else can see. When a popular new student from Barbados named Kalinda befriends her, Caroline is buoyed by their friendship. Kalinda, too, is estranged from part of her family A lovely middle grade novel about the power of friendship and family. When a popular new student from Barbados named Kalinda befriends her, Caroline is buoyed by their friendship. Kalinda, too, is estranged from part of her family and Caroline suspects she can see spirits as well. As their friendship deepens, Caroline begins to imagine future in which she and Kalinda are together. But just as Caroline tries to reveal her feelings, her message is intercepted and she is (again) left alone. Caroline realizes her only solace will be to find her mother.